(Bloomberg) -- Central banks in Latin America’s two biggest economies have a few things in common. For starters, they may soon begin cutting interest rates, perhaps even simultaneously like they last did during the global recession of 2009. The monetary easing wouldn’t be immediate. Mexico’s policy makers kept their benchmark at a decade-high of 8.25 percent on Thursday and struck a more hawkish tone than some economists expected. Brazil left its key rate at a record-low of 6.5 percent last week. But in both cases, investors and analysts are starting to suspect that a rate cut is in the pipeline. That’s partly for global reasons -- the U.S. Federal Reserve and its developed-nation peers are turning dovish amid rising risks. But Mexico and Brazil also share some political challenges. They both have new presidents vowing a radical change of course. Analysts aren’t sure they can pull it off -- and they’re scaling back growth forecasts. Combine that with inflation within target in both countries, and the two central banks are seen as having room to ease monetary policy. 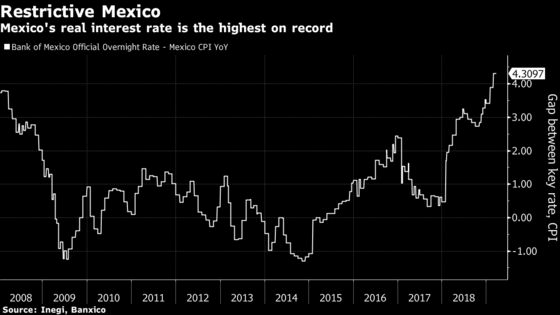 Mexico’s central bank has been hawkish, often citing risks to the peso and emphasizing the need to maintain fiscal targets despite the big-spending plans of President Andres Manuel Lopez Obrador, who was elected in July and took office in December. That outlook may change this year. Economists are slashing growth forecasts, partly on concern that the leftist leader will scare off corporate investors. Goldman Sachs predicts that the benchmark rate will be lowered by three-quarters of a point this year. Mexico’s real interest rate is among the steepest in emerging markets, and is currently at the highest level since the central bank adopted an overnight target in 2008. In Brazil, while the economy remains moribund, policy makers would run the risk of making the real less attractive to foreign investors at a time when Brazilian assets come under pressure, opening the door to a currency weakening that could fuel inflation, said Alberto Ramos, Goldman’s chief economist for Latin America. Brazil left its benchmark rate on hold last week but signaled it could lower borrowing costs in the future if growth continues to disappoint. The main obstacle for lower rates and the economy in general is political. Right-wing President Jair Bolsonaro faces significant hurdles in his bid to push a pension revamp he says will spur investment and growth. 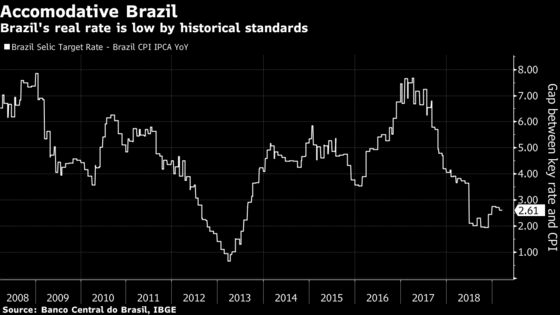 Yet persistent economic slack may allow for some more easing in Brazil, Alejandro Werner, the International Monetary Fund’s Western Hemisphere director, said last month. Elsewhere in the region, in Chile and Colombia, the next central bank move is expected to be an increase. But the odds of that happening anytime soon are diminishing amid subdued inflation. Argentina is one outlier, with the central bank battling inflation that reached 48 percent last year as the currency lost half its value. Venezuela lies even further out, because its hyperinflation and economic collapse make comparison with any market economy difficult. 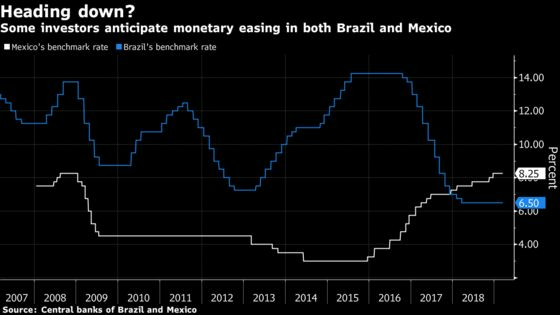 While Brazil’s new central bank president Roberto Campos Neto has repeated his predecessor’s mantra, promising “caution, serenity and perseverance” in monetary policy, new appointments to Mexico’s policy-setting board could spell changes ahead. One of them, Gerardo Esquivel, is the architect of Lopez Obrador’s spending plans. The other, Jonathan Heath, said before starting the job that he expected policy makers would be able to cut the interest rate this year. At their first board meeting in February, both voted to hold. Still, they’re likely to be less hawkish on inflation than their predecessors, Ramos said. “The stars seem to be aligning for the Mexican central bank to ease policy a bit,” Ramos said.